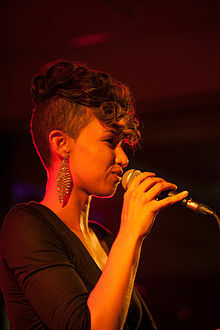 Antoinette Clinton (born September 29, 1985), known by her stage name Butterscotch, is an American beatboxer/singer/pianist. Butterscotch learned to play the piano at an early age as her mother was a piano teacher. Her siblings all played the piano plus one other instrument trumpet, cello, trombone, clarinet; Clinton had access to all these instruments. As Butterscotch grew older, she was exposed to beat boxing by her high school friends, and was inspired to learn the skill, adopting the stage name "Butterscotch" which originated from a song Antoinette had wrote in high school. She attended Natomas Charter School's Performing and Fine Arts Academy in Sacramento, California, where she focused on music. Clinton majored in music (classical piano) at California State University, Sacramento. Butterscotch's mom had to postpone her education at Sac State because her music career was taking over. In addition to the piano, she also plays saxophone, flute, guitar. She won the first Ladies Beatbox Battle World Championship in 2005 and won the West Coast Champion title in 2007 beating 18 men. Butterscotch has toured extensively with the Mike Patton-fronted band Peeping Tom, beatboxing in place of Rahzel. She was also a beatbox mentor on MTV's "Made". She gained national exposure in 2007 when she appeared on the second season of America's Got Talent. She both sang and beatboxed, as well as a combination of the two while playing the piano, for her performances. The judges passed Butterscotch through several episodes and she was voted back by the viewers several times. She was in the final four (the last stage of the competition before the winner is announced), before being voted out by the viewers on the show which aired August 20, 2007. Contestant's Choice "What's Going On"
^ "Performing and Fine Arts Academy Student Magazine". PFAA. 2016. Retrieved January 5, 2018. ^ "America's got talent - Butterscotch". nbc.com. 2018. Retrieved January 5, 2018. This page was last edited on 21 February 2019, at 06:19 (UTC).